As with any mountain hike or climb, you are rewarded with beautiful vistas, such as hiking to Kajmakchalan. Unfortunately on the day of this climb much of the hike was under an overcast sky but I managed a couple of good shots and really enjoyed the wild flowers along the way. This hike, such as the hike to Titov Vrv, does not have any excessively steep inclines, except for the very final stretch. Getting to the top of Kajmakčalan (Kajmakchalan) is very accessible for beginners, especially if you are prepared. I wasn’t. On this day I didn’t have the right shoes nor did I have any hiking poles. Much of the way is just walking a dirt road and it seemed easy enough. Near the upper part of the climb we encountered a sheet of hard snow covering the slope that we needed to cross. Going around it would have really added time to the climb so we took it on. See pictures #3 & 4 in gallery below. Djoko and Siniša crossed first with no problem to show me how it’s done. I started and about 30 meters into the sheet I lost my balance and started sliding down the mountain. Below me I saw some tufts of grass and I started clawing into the side of the mountain like a wild cat to steer myself over there and to slow down my momentum. With God’s grace I made it to the island of grass just below a rock outcropping (see right side of picture #5), my left hand grabbed a fist full of grass and my right hand grabbed a root, and just like in the movies, the root kept coming out of the ground. Fortunately, my left fist was still holding onto grass. I laid there on the side of the mountain to catch my breath and to let my racing heart settle. So, I’m hanging onto the side of the mountain and Djoko calls out asking me if I’m okay. I reply that I am fine but I am concerned as I am still not sure how to get out of this predicament. With my camera bag on my back I literally crawled up the face of the slope digging in the snow with my hands until I reached the point where I slipped and fell. Then I proceeded gingerly across the remaining part of the sheet of snow to terra firma. On the way down the mountain we went around the sheet of snow and that’s when I took the pictures of the sheet. We determined that I slid down the mountain for about 70 meters. It sure felt much further than that. Not only did I not have the proper shoes or a hiking pole, I was also wearing shorts so I had serious abrasions down my right leg and thigh. Near where we parked there was a fountain and after I cleaned my thigh and leg from the snow, mud and pebbles, Djoko poured rakija over my leg to disinfect it. YEEEEOOOOOOW! I’m still amazed at how much snow is left as it is the 24th of June. Quite often at the top of some places that you climb, you can find a rubber stamp featuring that place and you can stamp a post card or whatever. In the church there was such a stamp but all I had was my passport (see picture #20). I traveled through many countries after that and not a single official made note of it. 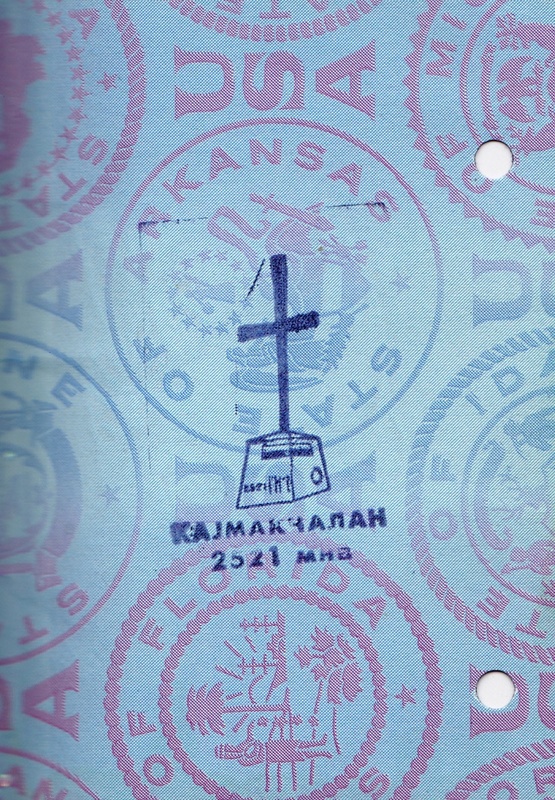 Kajmakchalan is located on the modern day border with Greece. During World War I this was the site of a major battle between Serbia and Bulgaria. On the top of Kajmakchalan is a church and monument dedicated to the victorious Serbs and there is an ossuary where the skulls of Serbian soldiers are kept. On pictures 21 through 24 you can make out the church sitting on top of the peak and picture #25 shows the start of the hike. Djoko and I are in pic #28, with Siniša in #29 and the last picture was taken in the ossuary.